Atkins Diet Weight Loss – Is the Atkins Diet a Good Weight Loss Program? If you’re interested in Atkins Diet weight loss, it’s probably because you’ve heard about the amazing results you can get quickly in the first phase of this diet plan. It’s true that you can rapidly shed pounds during the early phase (called the Induction Phase) of this diet plan, but you’ll discover that your weight loss will slow down after you move onto the “Ongoing Atkins Diet Weight Loss” phase. But don’t let that discourage you! Is the Atkins Diet a Good Weight Loss Program? The Atkins diet weight loss plan is divided into different phases so that you can jump-start your diet. It’s a way to motivate you (hey, I know I was thrilled when those first pounds came off in one week!) as well as get your metabolism kicked into high gear. The reason you don’t stay on the two week Induction phase for any longer than fourteen days is because it’s too restrictive. It would be too difficult to stay on and you need to branch out into other nutritional foods as time goes on to make sure your diet is balanced and healthy. There’s been a lot of study comparing different weight loss plans, and most acknowledge that using the foods on the Atkins plan for several months causes significant weight loss. On average, dieters using the Atkins Diet lose about nine pounds more than people just cutting calories over a four month period. The key to keeping it off is the “Stabilization Phase,” when you can eat a wide variety of foods but still have to keep those carbs under control. I now eat the occasional baked potato, but I don’t stuff myself with carbohydrates every day. You may not lose the same amount of weight during any of the phases of the Atkins Diet as your best friend, but you’ll definitely lose. And guess what? Your health will improve, too! A low carb diet will reduce your triglycerides (these are the dangerous blood fats that can lead to real health problems), so sticking to the Atkins Diet foods list long after you’ve lost the weight you wanted to is simply good sense. Men tend to lose weight faster during the Induction Phase of the Atkins diet, so if you’re doing this with your husband don’t get discouraged. It’s a physiological reaction, especially if you’re in the “child bearing years,” that women tend to have more difficulty losing weight. It’s the body’s way of making sure women can carry children safely. That’s why any of you women out there should keep at it – it takes you a while longer to jump-start the metabolism. Soon you’ll be shedding weight almost as fast as I did. Talk to your doctor about the Atkins diet weight loss program and take a list of the foods on the program with you. He can explain how to make it work for you – mine suggested combining the Dr. Atkins diet plan with some low-impact exercise like walking and yoga. He also told me that there are lots of doctors who have successfully used the Atkins diet. I don’t know about you, but there’s not a much better recommendation than that! 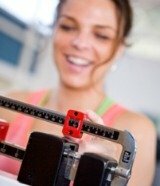 How much can you lose with Atkins weight loss? A recent study showed that the average person can shed 6.8% of your body weight in just the first three months. That means if you weight 175 pounds, you could shed 12 pounds in the first 3 months. Keep going on the diet, and you’re sure to lose more. The Atkins diet weight loss plan is great because you don’t have to stay on the “diet” phase forever. The list of foods expands as you keep going, and when you get to the Stabilization Phase, you’ll be so familiar with how to gauge what is and isn’t a low carb food that it will just come as second nature to avoid the wrong foods. It becomes a way of life, not a diet. I’m still at my target weight after almost a year, and you can be, too!